This situation popped up on my Facebook news feed today since I follow a few T1D pages. They are a great source of inspiration, laughs, and information that I can share with my hubby. I may not be the T1D in this house, but I am a strong advocate. I don’t even know where to start. Mostly I will let the ignorance speak for itself, but just in case you were wondering… T1D (or T2D for that matter) is NOT contagious. Also, the needles used for injections are so very thin and tiny rarely does the person injecting bleed. As well, this is a massive violation of ADA laws. 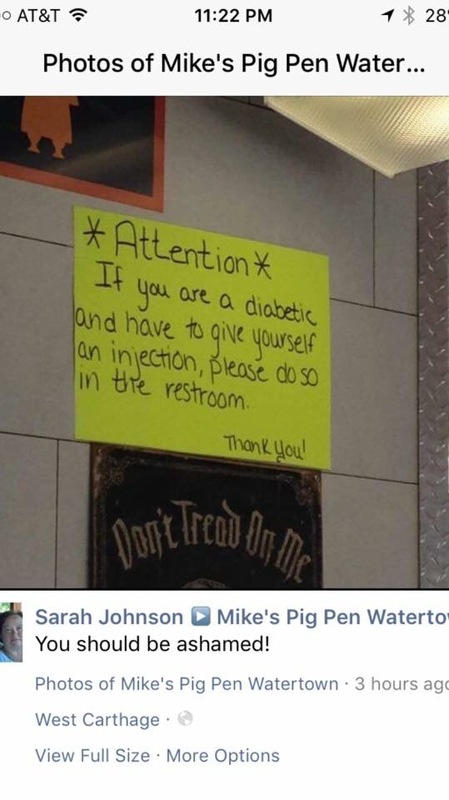 Lastly, unless you are claiming that your bathrooms are cleaner than your dining room, it is quite unsanitary to administer injections in a bathroom. Oh, and by the way, although now removed, this picture was posted BY the restaurant. 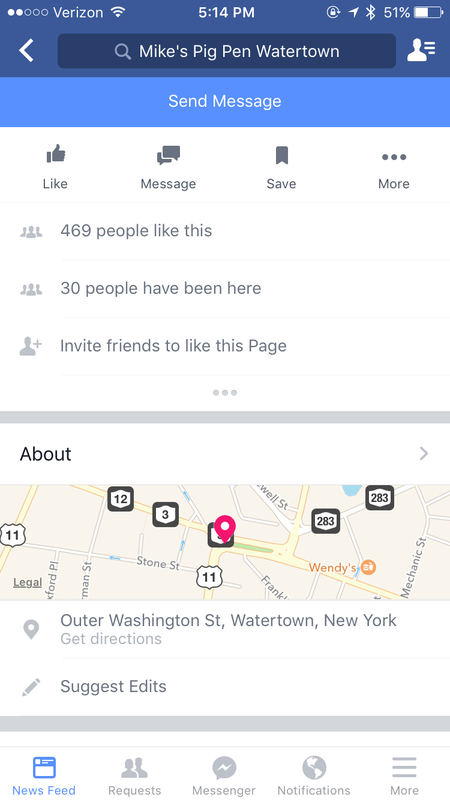 May I suggest the Wendy’s up the road for your meal instead? Some say ignorance is bliss, but, I think in this case, ignorance makes you look like a huge arse. I started this a couple years ago, and put it to the side. I feel the need to finish it now though, and hope it will explain a few things. I know this isn’t my usual crafty stuff, and I’ll get an update on that soon too, but this needed to happen first. Before this diagnosis, he was an aspiring hockey player (he is from the frozen Midwest after all) with not a care in the world (as any 11 year old should be). Now we have a son, not much older than that, I can’t even begin to imagine. As a wife though, from the time I found out (funny story there), to now, I have given shots, spoon fed Lucky Charms, waited anxiously through tests, two eye surgeries, a hernia surgery, and dug through grocery store shelves to find that ONE bag of fruit gummies (his favorite low blood sugar treat) with more of his favorite flavor, and that’s just a tiny piece of it. Because, I love him, and I married him the man, NOT the disease. Now, to the part that will probably get me LOTS of comments and such. If you are a Type 2 diabetic, go away. No offense intended, at all, but in 80-95% of cases, you can get rid of your diabetes (to those in the small percentages, I’m not talking to you). Type 1’s cannot. Ever. It doesn’t matter if they are under, over, or a perfect weight, doesn’t matter if they adhere to the strictest of diets, doesn’t matter WHAT they do. T1D will ALWAYS be there. I know it seems harsh to say “go away”. But seriously people. There are ways to keep T2D under control to the point of no medication (and before I get blasted, yes I know there is a percentage of people this is not the case for, but you aren’t the ones I’m talking to), or gone completely by doing what your doctors, nurses, exercise coaches, and nutritionists tell you. All that being said. I’ve read some disturbing statistics over the years. The rate of T1D diagnoses has gone up 23% in the US between 2001 – 2009. Also, I believe it’s somewhere in the 80% range of the funding for diabetes research goes to Type 2, NOT type 1. That being said, if you want to help, http://www.JDRF.org is the place to go. They are dedicated solely to finding a cure for T1D. Push your local and federal leaders to support JDRF and increase the funding to find a cure for this. My DH has been very blessed. No major problems from his diabetes. One eye has a few issues, he’s had some mild neuropathy. We are exploring options of a cure called Islet Cell Transplantation. It involves surgery, and time away from home, and a myriad of things I won’t get into right now. So, to all those people that say, “why don’t you get DS more private lessons?”, “what about this or that summer intensive?”, “how about these shoes, tights, clothes?” or sympathetic looks when I say my DD is doing technical college before transferring to a four year, like I’m doing something wrong. When I say back, “no sorry, we can’t.” or “only if there is a scholarship for it.” or “thank goodness my dad is willing to pay for this or that”. I’m not kidding. I’m not lazy. I home-school my DS, keep up with the house and laundry, taxi both kids everywhere they need to go in my 10 year old car, am taking 24 college credits from March to November (that’s 3 credit hours every 5 weeks, or the equivalent of two full 12 credit hour semesters in about 8 months with no breaks. None, seriously, I will finish a class on a Monday and start a new one on a Tuesday), and am seriously looking at any offer of a job, even if it’s bagging groceries. And you know what. I’m not ashamed. Not of my circumstances. I’m a bit embarrassed for everyone that thinks I should be “doing better”. But you know what? I am happy. I am stressed out sometimes, and seriously wish I would manage to land a winning lottery ticket some days, but I am happy. My kids are happy. My husband is alive, and as healthy as can be expected. All I’m hoping for is a little more understanding. A little less, “oh you all should do this, that, or travel here or there.” It sounds great, it really does, but that’s not where my priorities are. My priorities are educating my children, getting my own education, and keeping my husband as healthy as possible for as long as possible.